Snowdrops get all the attention for blooming so early, in late winter when supposedly nothing else is blooming. 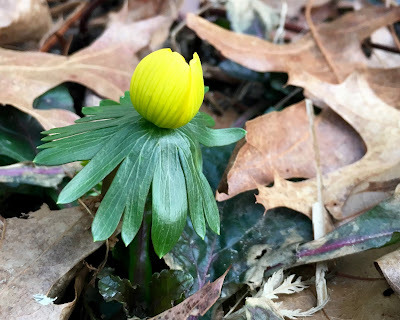 But what about Winter Aconite? Now I do get why Snowdrops are far more commonly grown here than Winter Aconite. Snowdrops are very hardy, easy to grow plants, and they are decently easy to sell as dried bulbs in fall. 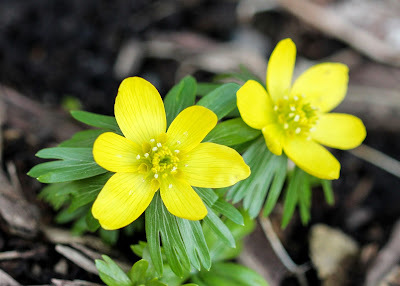 Winter Aconite are fussier both to grow and to sell. Bulb growers will sell dried Winter Aconite tubers in the fall, but the tubers really resent being dried out. 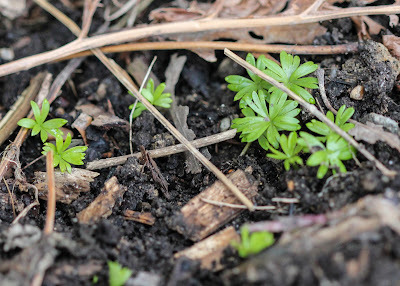 Out of the several dozen Winter Aconite tubers I've planted, only a handful have actually come up. Soaking the tubers well before planting them helps to rehydrate them and increases the chance that they will come up. Margaret Roach from A Way to Garden has recommended buying wax-dipped tubers that are now being offered from places such as Old House Gardens, as the wax prevents them from drying out so much. She has had much more success with these (100%! ), so that definitely sounds like a better way of selling them! Winter Aconites are critter-proof, so once you get them established, they are thankfully pretty hardy and long-lasting. When happy, they seed around and make large colonies of Winter Aconite in the garden. They are best divided and moved in late Spring after their foliage starts to fade. 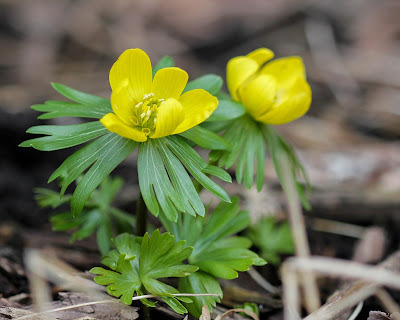 There are two types of Winter Aconite commonly sold here in the States. Eranthis hyemalis, native to Europe, is the most common one. 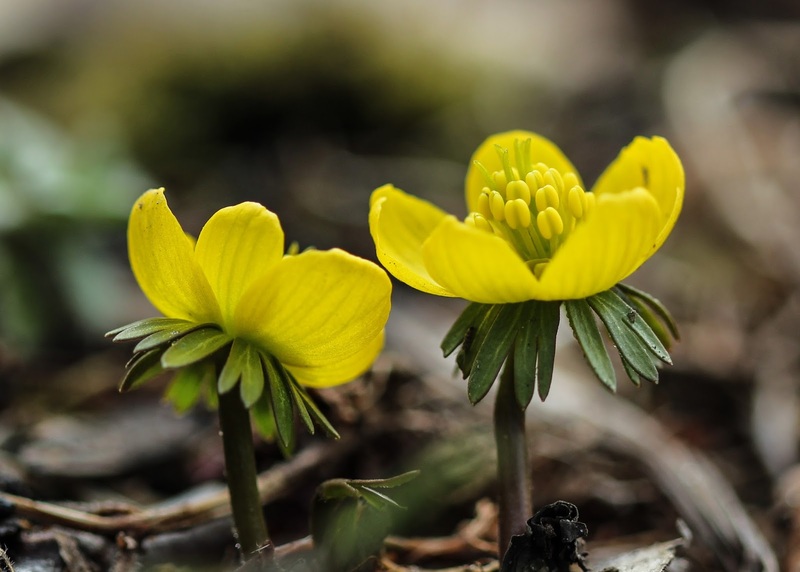 Eranthis cilicica, native to Asia Minor, is now thought to be a possible subspecies of E. hyemalis. It blooms slightly later, has slightly larger flowers, and more deeply divided foliage than E. hyemalis. E. hyemalis is said to prefer more alkaline soil, while E. cilicica prefers a more neutral soil. There are also several Asian species, some with beautiful white flowers, but rarely sold here. 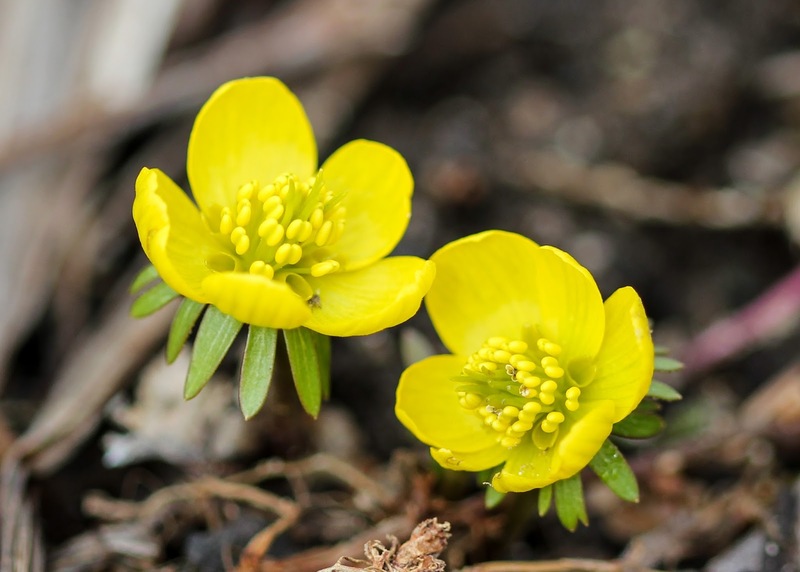 There are several cultivars of Winter Aconite out there, mainly from German and Scandinavian breeders, but they are hard to find and expensive here in the States. E. hyemalis 'Flore Pleno' has doubled flowers, 'Schwefelglanz' has pale yellow flowers, and 'Schlyter's Triumph' has orange flowers, to name a few. 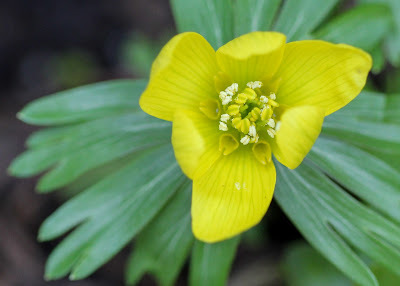 I am hoping that Winter Aconite will become more popular over here, and we will start seeing more interesting varieties available. After the long winter, though, we will take whatever color we can get in the garden! And I so enjoy those little splashes of yellow that pop up right after the snow! These are lovely plants, and I am sorry I am too far south for them. I have seen photos of sweeps of them that are breathtaking. It seems they can be very successful if they find the right place to grow. After living down south, it really is a trade-off as to what flowers I can grow. Winter aconites and lilacs do well here, but I do miss camellias and crepe myrtles! Very pretty. I like them paired with your heuchera too. It's a nice contrast. I'm guessing I'm too far south to grow them so I'll enjoy from the computer. But I agree with you, nice to see some color other than winter after a long winter of snow. It's snowing again, too, so more white! After getting used to March being spring when living down south, it's hard to wait another month or so! What nice color to see so early in the season, and it looks like your attempts at getting them started in the garden are paying off! Mine are ever so slowly spreading, but based on the increasing numbers of seedlings I think one day I'll be surprised by how well they've taken off. We'll both have sheets of yellow! That would be nice! I have quite a few seedlings, so I really hope they make a nice carpet of yellow. I am probably my greatest enemy, as I am always digging stuff up and moving stuff in the garden, so I will have to mark them! I planted dozens of them a couple of years ago and had quite a show the first year. Last year, I didn't see very many. My climate, location (sun in winter; shade in summer), and soil (silt-loam) are right. But I'm thinking maybe the droughty conditions of summer might not be the best for them. Even if a few come back I will be very happy. So far, the only things that have bloomed here are Snowdrops and a few Tommies. Several other bulb plants are getting ready, as are the Hellebores. Happy spring! I have my winter aconite in quite a bit of shade, and it stays pretty moist there, so the moisture might be the key there. Happy spring! The first daffodils started opening in my garden, but sadly it is snowing again here. Hoping it melts again soon! 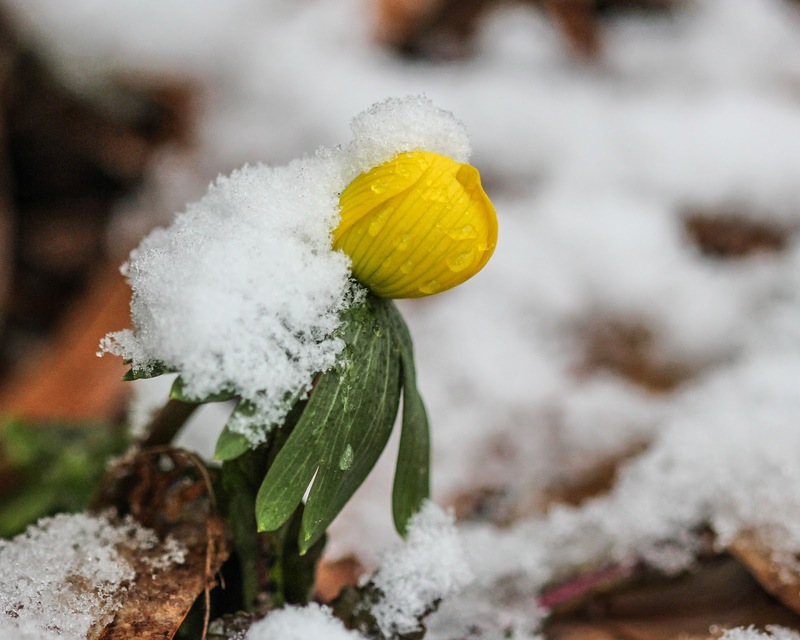 I'm glad to learn of the wax-covered aconite bulbs - I must try those! I was excited to learn of those too! When you buy bulbs, you want them to all come up! 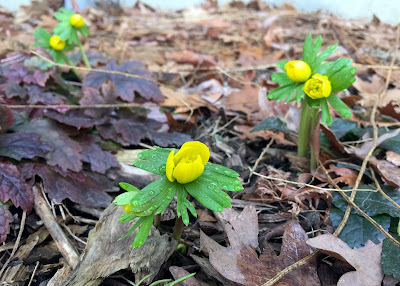 Winter Aconites definitely deserve some love. I don't have any (yet), but where they have been well-sited and form large patches, they are really stunning. I don't think I've even seen a large patch of winter aconite in person before, as they don't seem to be grown a lot around here. The pictures I've seen are stunning though! Hopefully I will have a good-sized patch of my own in a couple years! That's great that yours are increasing too! It was only recently I learned there were so many other varieties. They would be so fun to have in the garden. My first attempt wasn’t successful so I must try again. They are lovely, I’d like them in combination with snowdrops! 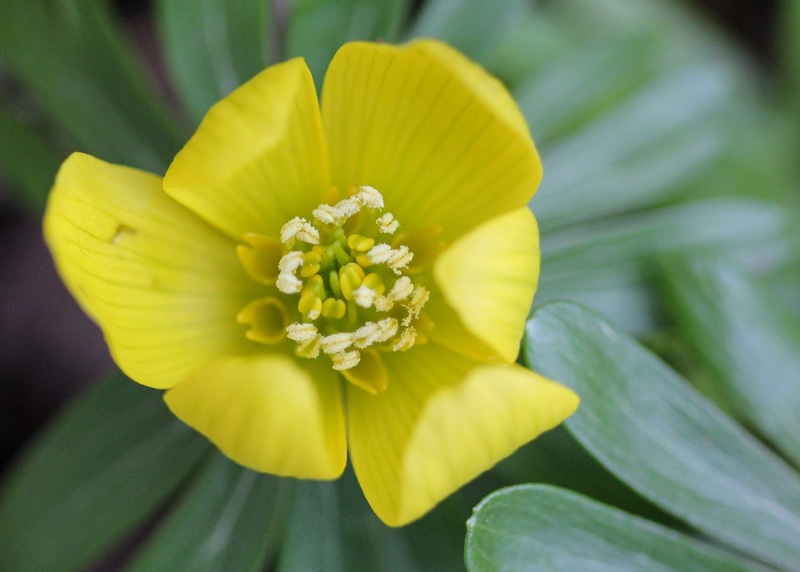 There's a pale yellow cultivar of Winter Aconite that would look so pretty with some of the yellow-tinged Snowdrops. No telling how much that would cost, though! I agree, The Winter Aconite is definitely deserving of our support. Such a cheerful flower for northern climates, right?